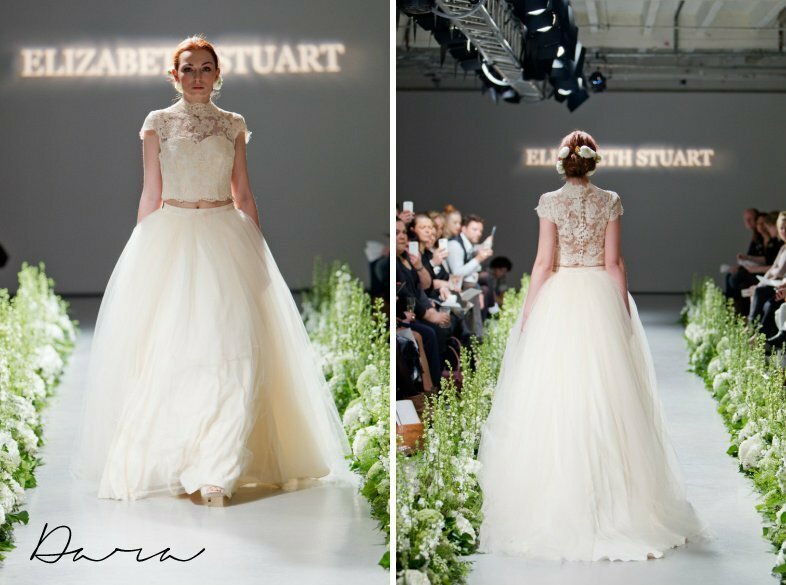 Recently we planned a showcase for Elizabeth Stuart designer wedding dresses. 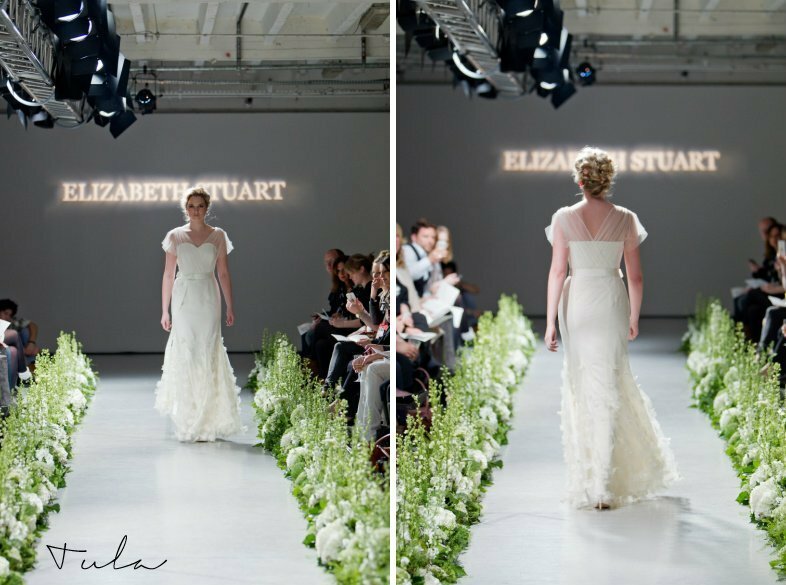 On the day that The White Gallery were showcasing Alan Hannah and Ian Stuart in Battersea was I heading there alongside the hordes of eager buyers ready to flex their plastic and snap up the latest must-haves? No, not me. No siree. I was back in my old stomping ground of Bloomsbury. Walking the streets with the sound of birdsong in the air (birdsong is tenuous, perhaps pigeon coo-ing is more apt, if slightly less romantic), bucking the ‘everyone will be their trend’ (though, make no mistake, anyone who was anyone was heading north) and following my IPhone map to the very heart of London and the fabulous B1. Oh how times have changed. Once upon a time, not so long ago, this would have been done using an A-Z, and it was the East where it was at. Before that you had to go South of the River to find a happening scene (and by go, I mean get the Victoria Line as far south as you could, whereupon you would have to hop either onto three buses, or a mainline train, and still walk the final 10-minutes). And then the East became the happened scene. And the South became all developed, Metropolitan and the perfect place to have a family, not to mention a venue for all the main stream stuff…The 02. Brixton. Just all so EASY. It’s not lost on me, as a South Londoner how times have changed. But life has a funny way of turning full circle, and now I find myself in the easily accessible Central London seeking out the new and exciting. 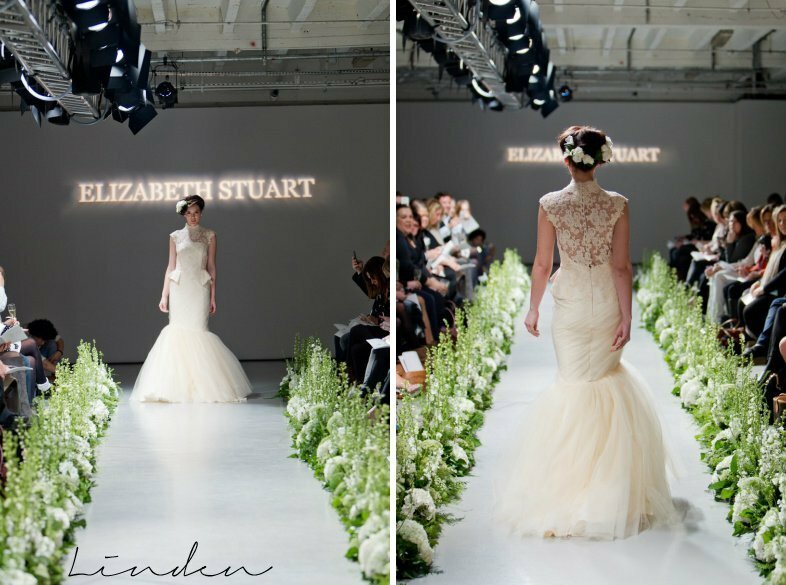 I’m was there for the small matter of the debut independent runway show by Elizabeth Stuart Bridal. 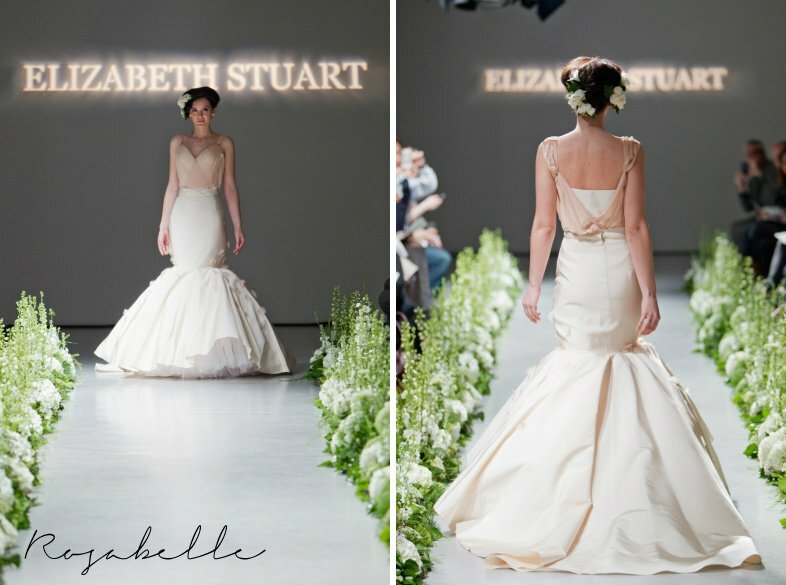 Here at Love Scarlett, it’s not as if Elizabeth’s talent is something that we didn’t know about… she showcased her beautiful 2013 collection at the White Gallery last year, but an independent show? 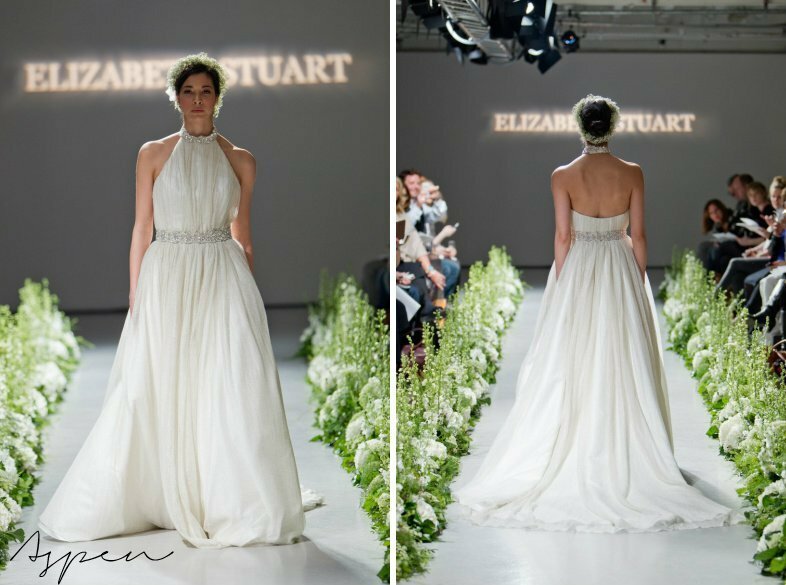 Well that is something altogether more special: Already a Love Scarlett partner, we spent much of last autumn drooling over her 2013 collection. 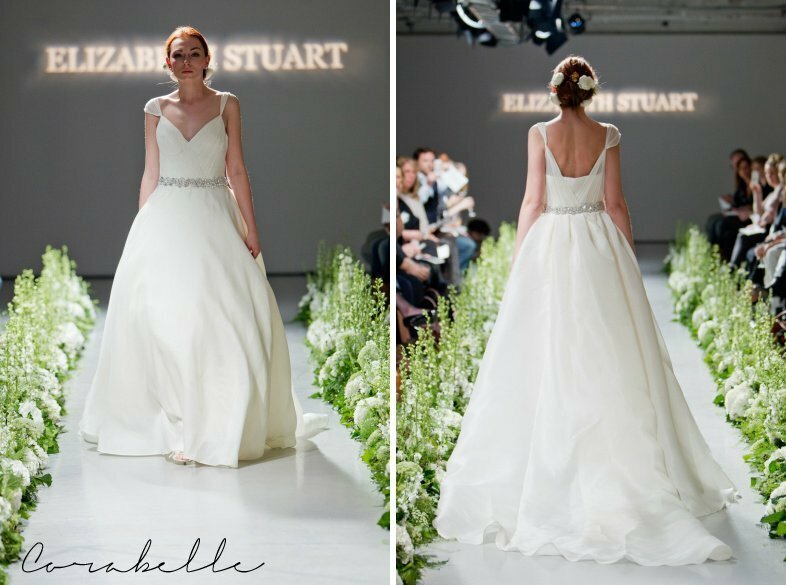 Her take and reinvention of the fairy-tale dress is something to be admired, her use of fabrics and feminine elegant and timeless (but oh-so-relevant) silhouettes is just, well there’s a reason that we’re here alright. And it’s because when the press release arrived we knew we had to be here. From the very moment that I enter B1 the production of the catwalk show grabbed me – not to mention the attention to detail. From the fourteen foot floral installations by Elizabeth Marsh to the sensational Canapés from Ginger Jar Food (which, like the whole show echoed the seasons. For your Autumnal taste buds a Squash and Goats Cheese salad, to your florally decorated cake pops that scream spring by Love Scarlett favourite Abigail Bloom). And it was all washed down with delicious sparkling English wine from Digby Fine English. The overall styling had the most amazing vibe: the lighting and flowers made the urban basement space feel like a Midsummer Night’s Dream meeting a chic minimalist interior. Utterly divine, and, well the aesthetic can be summed up in the title of the whole show title rather than my attempt, because quite genuinely ‘The Enchantment of the Seasons’ suddenly makes sense when you see it styled like this…The detailing was everywhere: the floral headpieces, the sweetest smelling catwalk I’ve ever had the pleasure to sit alongside (with hydrangea and stocks, in sublime spring greens and whites by the oh so talented Wildabout Flowers), it was just perfect. The thing about fashion is it can be pretty fickle. It can (and should) make you smile, and fashion shows, well they are the really very exciting bit where all that work (and, be under no illusion, it’s a whole lot of work) comes together and showcases the designers very own vision of perfection. And of course perfection is a subjective thing. And that’s why there are lots of different designers, all with that slightly different aesthetic. So long as the execution is flawless (and the execution must be flawless), then there is room for every one of them. Providing they are good. And providing that they really do offer something different. With her debut independent show, it would appear that Elizabeth Stuart is cementing herself as more than just good… the attention to detail, the finish, and more importantly the whole production, had my typing finger and Love Scarlett Instagram account in meltdown as I tried to upload the next swoonsome design as quickly as I could, before rushing to capture the next one. I’m not one for living life through a lens, but when you see design and production this good, it demands to be shared. Immediately. 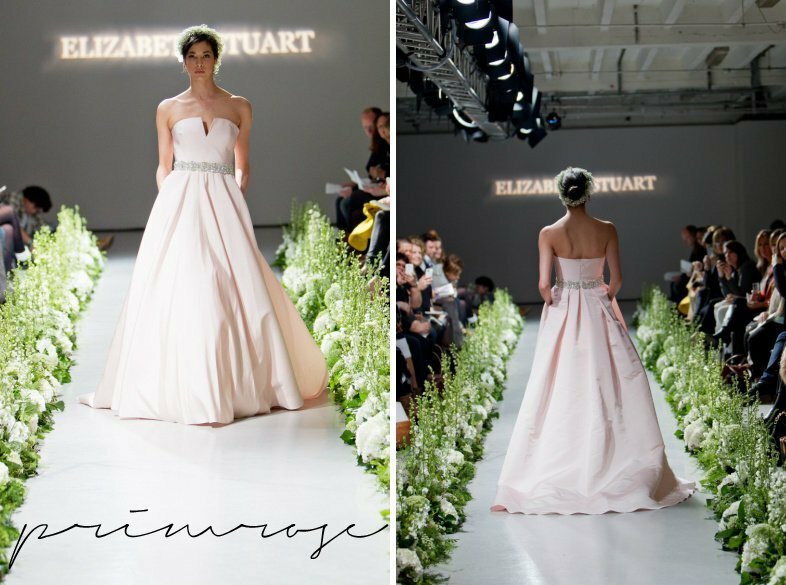 Bridal fashion is – and this is where it gets so exciting – so restricted. 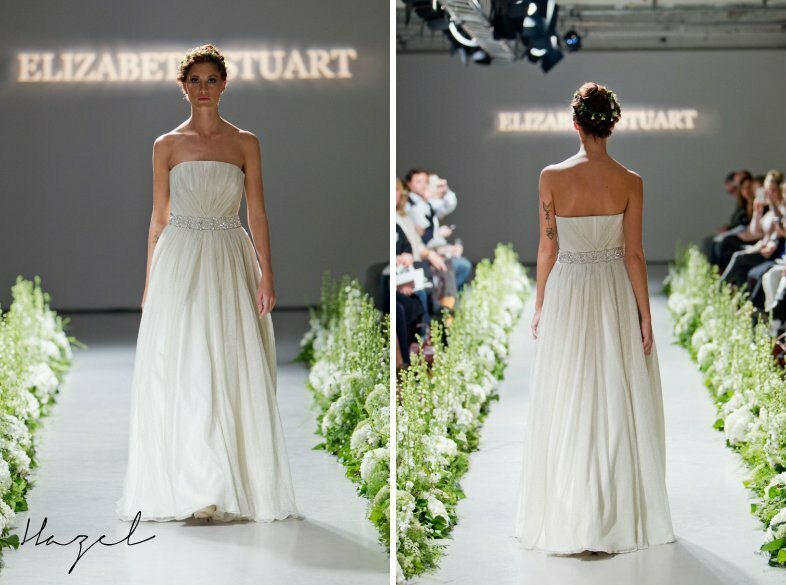 The dresses are usually long, you’re looking at a predominantly white/ivory colour scheme, and so a show really, well as the name suggests, showcases what makes that designer different. Sometimes – albeit rarely -, the moment you walk into an event, you just know you’re going to spend the entire time with the kind of smile on your face that pretty much takes it to your ears in a broad feast for the eyes where every single detail has been thought through, the finishing touches are everywhere, and you just get the feeling that this, this is where it is at. And my, aren’t I lucky to be here. 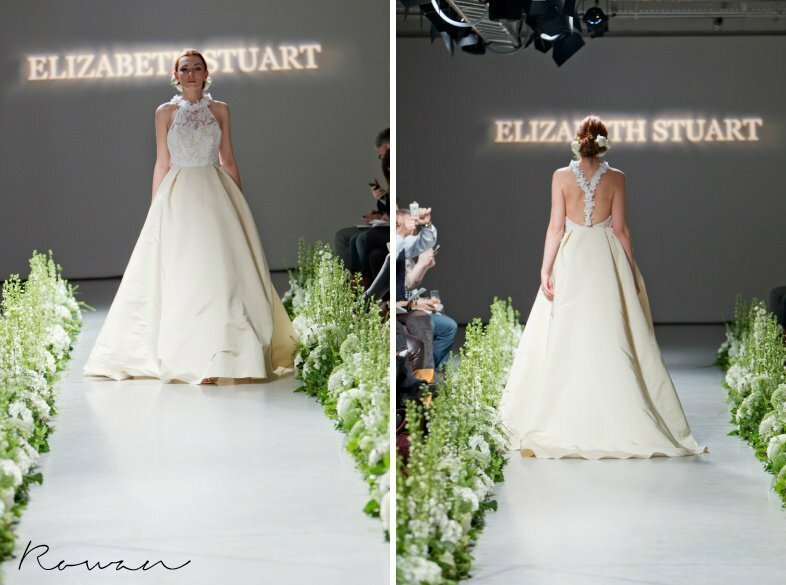 As soon as the show starts it’s clear to see why Elizabeth is being talked about, and why – in the very near future – her designs will be gracing every front cover across the country… and, with the presence of several American buyers in the front row tonight, the World. As soon as the first beats of the Laura Mvula’s ‘That’s Alright’ hit the speakers, and the lights go up, the ambience shifts. Backs are more upright. The room leans forward in anticipation and pens are taken out, notes hurriedly scrawled on exquisitely produced programmes as buyers, writers and the press eagerly await to unveiling of The Enchantment of The Seasons and to work out which ones they *need* for their boutique (all of them I fear…). As a bystander, it’s hard to have a favourite. The collection flows so eloquently though the seasons through its subtle shifts in fabrics, necklines and shapes: from the playful Spring cropped two pieces through to the Winter finale where an exquisite metallic mesh is overlaid on Hazel and Aspen to breathtakingly beautiful effect it is abundantly clear that a whole lot of time, thought and design has gone into something that looks so effortless. 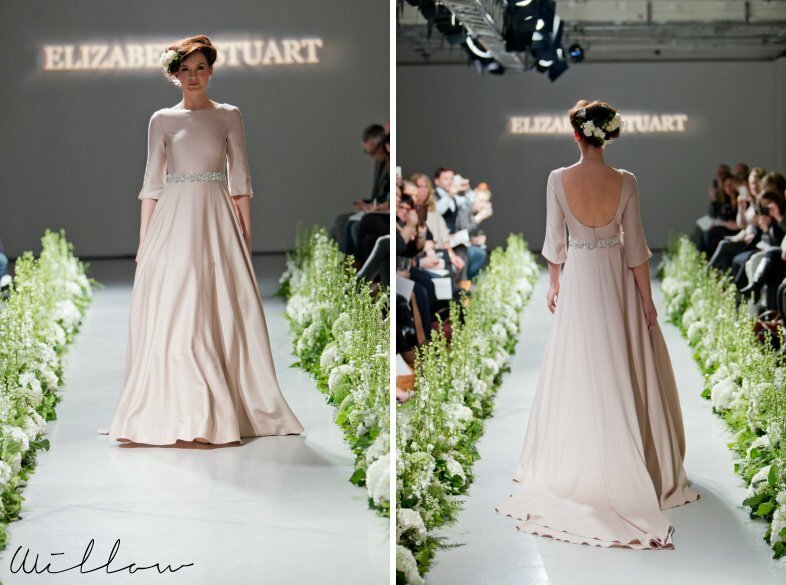 But if forced to choose, the Rosemary dress with its layer upon layer of delicate tulle in a soft Peach colour would be mind. It had every FROWer uploading to their Twitter feed in awe. When I got the press release to accompany the runway show I took note of the word unique. Unique and bridal are two words that I rarely see together and believe. 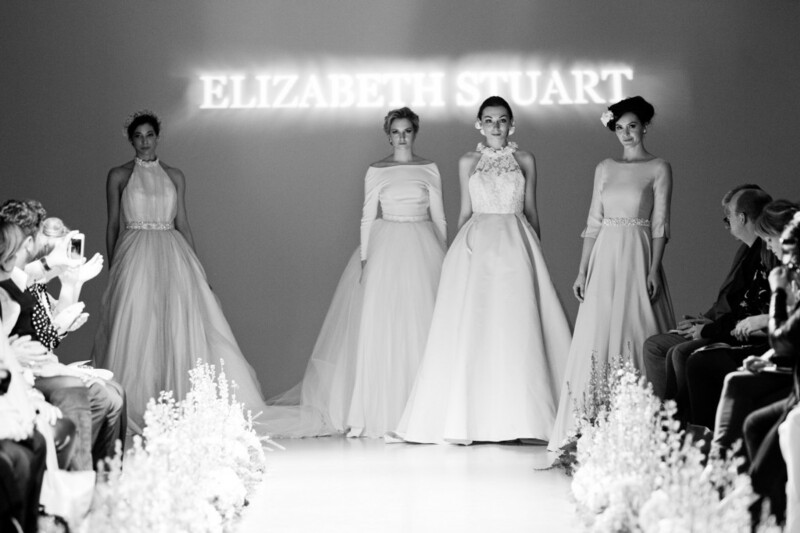 However, the Fall 2014 collection from Elizabeth Stuart genuinely is something different, and, well, you guessed it… unique. 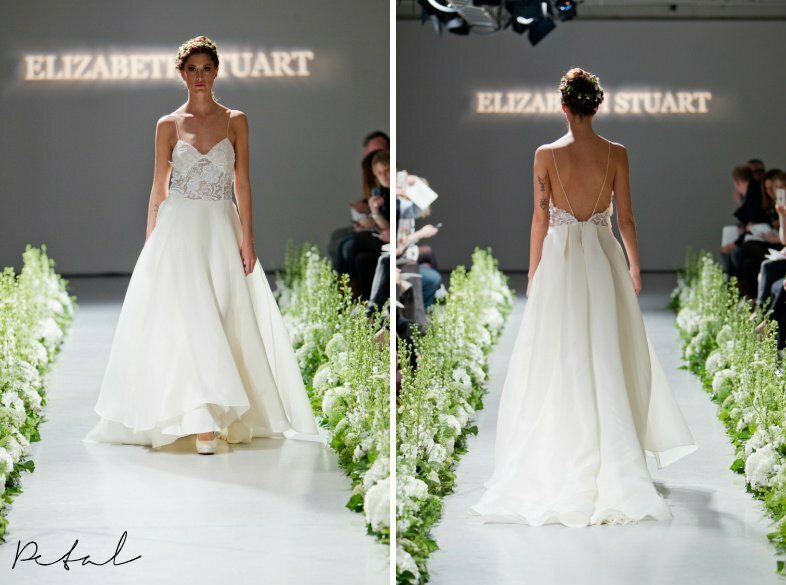 Elizabeth has, I believe, done something really rather clever with the Fall 2014 collection: there is something for every bride. You can see a fashion forward bride totally rocking the cropped two pieces, or the wonderful Peplum detail on the Hollis dress (Peplum, in a wedding dress, who’d have thought it!) Just as much as you can see a destination bride adoring the plunging back on her Petal design. 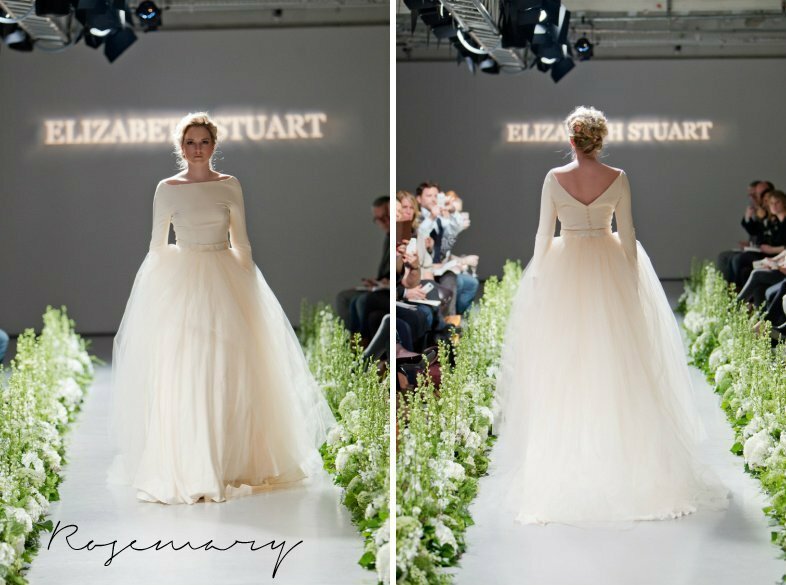 For the woman who wants to feel like she’s stepped out of a fairy tale? Look no further than Primrose or Willow, or if you need the addition of laser cut flowers on layers of delicate tulle then the Tula dress gives you this on an elegant fishtail silhouette. 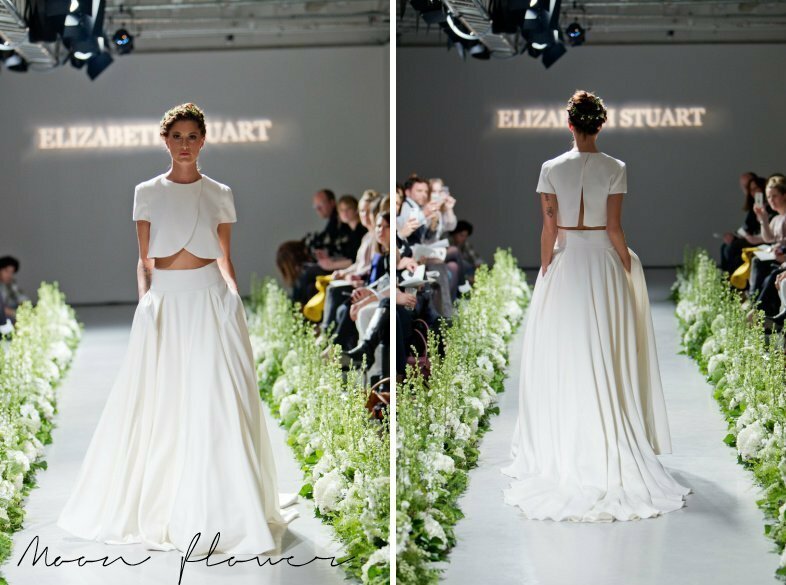 To cater for all brides like that in one collection? That’s not an easy thing to do. The exquisite use of colours as well just ensures that while there is a definite bridal look, it’s a bridal look that each individual can tailor to suit them and to make them feel their best. Which really, if you think about it, is exactly what your wedding dress should do. It’s easy to forget that. 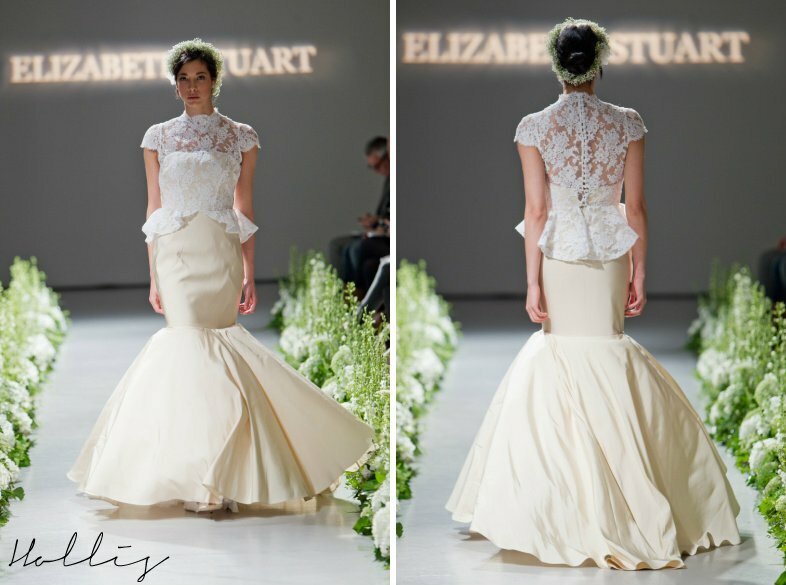 Just as well for us, it’s clear that that is exactly what Elizabeth thinks about when she creates her collections. Next week stop by Love Scarlett to see the film, hear the catwalk music and see behind the scenes photography by Hannah May.